A plate should engage the senses and draw the diner into it much as a painting will draw in the observer. The dish should be carefully planned to balance tastes, textures, colors, and cooking methods. Intertwine the components to bring a sense of composition and harmony. The process begins by incorporating the best and freshest ingredients, executing accurate knife cuts, and using precise cooking techniques that highlight the quality of the food and the talents of the chef. The dish is pulled together by the sauces and other complementary ingredients. The final touch is the judicious use of garnishes. Each element should be there for a reason, adding dimensions of flavor, texture, and color that is in harmony with the finished plate. The main item is usually the focal point of the plate. On a savory dish this is often a protein such as meat, fish, or poultry that requires butchering skills, portion control, and cooking techniques of the highest caliber, to achieve the desired results that are essential to the success of the plate presentation. Vegetarian dishes frequently highlight pasta, risotto, grains, and legumes, which are delicate items that, once prepared and plated, must be served immediately to retain their fresh appeal. Appetizers, including soups, salads, charcuterie, or small shared plates, should be plated with care and precision for maximum visual impact. Fresh, crisp, colorful salad greens with attractive garnishes, soups presented with the proper consistency and adornments, and charcuterie precisely prepared and sliced, are important for the opening of the meal. Desserts, as the closing chapter of the dining experience, should include fresh, rich, and sweet flavors with textural variety including cookies, crusts and garnishes, bright color variance from the use of fruits, herbs, and sauces, and visual appeal. Proper execution requires the crisp textures of pastry, the smooth and creamy consistency of a gelato or mousse, and colorful garnishes of herbs. For appetizers and desserts that serve as bookends of a meal, there may be one single focal point or several, in which case creative plating will achieve the best results. Vegetables and fruits often constitute the supporting elements of a dish. Whereas proteins tend to be various shades of brown, beige, and white, fruits and vegetables add color and provide a high visual impact. Precise cuts help to create an elegant presentation. Carefully controlled cooking techniques will yield vibrant colors and accents. Textures achieved through variety in cooking techniques include starches, grains, and legumes prepared as smooth purees, al dente pastas, and creamy risottos; or as crisp textured frites, chips, and croquettes. Supporting components provide height in the form of mounded purees, pastas, and grains to support the main item. They contribute to the overall appearance by providing variety in taste, color, shapes, and textures. Garnishes provide color and a finished touch to the dish. Choose items that are appropriate to the dish and that echo some of the ingredients. They should be functional, not merely a sprig of rosemary or a wedge of lemon, but incorporated as part of the plate concept. A tuile cookie for enhancing a gelato dessert, a tempura fried Meyer lemon slice to complement a sautéed fillet of fish, or delicate micro-greens to garnish a salad are all examples of functional garnishes. As the final touch of the plate presentation, garnishes must be precisely prepped to maximize their impact and give the plate the final visual pop. We often speak of plates when plating food but service ware includes plates of varying sizes, bowls, cups, and other vessels used to hold the food. Plates and serving vessels come in a variety of colors, shapes, and sizes. They may be simple white, starkly black, or earth tone colors. Other materials may also be incorporated including metal or wood. The style of dinnerware used depends on the type of operation whether causal or formal. Plating choices also are influenced by the style of food, the chefs vision, and the overall image the operation is trying to convey. Carefully consider your audience and the venue when choosing the style of service ware. For example, a fine dining restaurant might consider china or porcelain that conveys a sense of elegance. A casual restaurant may choose ceramic or stoneware that matches a more rustic dining experience, while a quick service operation could opt for economical plastic and melamine. An off-premise catered venue might decide that eco-friendly, disposable and compostable service ware made of bamboo or other recycled materials is a good fit. Service ware also includes materials like glass, wood, slate, tile, and metals of cast iron or stainless steel. Some chefs choose custom-made plates as a way to distinguish their cuisine using natural materials, reclaimed wood, or architecturally unique designs that are as artistic as the food itself. Plates and service ware come in a variety of geometric shapes including classic round, as well as square, oval, or rectangular. They may be teardrop shaped, oblong, or spoon-shaped. The size of the plate is dependent on the style of restaurant; for example a family-style restaurant might use larger plates, while a restaurant that features small plates for sharing would logically use small plates. Fine dining restaurants tend to use oversized plates, for example a 12 inch/30 cm dinner plate or a 7-9 inch/18-23 cm appetizer plate. Oversized plates act as a canvas providing negative space that frames the items, provides focus, and brings out the colors and characteristics of the food. Large plates also prevent crowding and food overflowing on the rim. The size of the plate affects the perception of quantity and portion size because the larger the plate, the smaller the portion appears to the guest. Smaller plates, bowls, or ramekins can be nested to accent or highlight components. Japanese Kaiseiki presentations use dishes of various shapes set on a rectangular underliner that emphasizes an asymmetrical or unbalanced, yet organic plate composition. The color of service ware affects the overall presentation as well as our taste perceptions and even our appetite. White plates are a traditional color favored by chefs because it makes the vibrant colors of the food more visually appealing to the guest. White plates are like a blank canvas that chefs can design without concern for color clashes from contrasting plate colors. Black plates provide an opposite contrast that can be used effectively with brightly colored foods. However, earth tones of brown, tan, warm gray, and greens that emulate the natural colors found in dirt, moss, trees and rocks can be used when paired with the right food colors. Green foods, including salads and vegetables pair well with yellow plates. Beige foods including pasta, chicken and potatoes pairs well with black and brown plates. Red foods including tomatoes, beef, and red sauces pair well on white plates, while yellow and orange foods including eggs, corn, and curries pair well with blue colors. Solid colors tend to dominate but some restaurants use patterns as a signature style. Some chefs today commission and even help design custom serving pieces and tableware. Colors affect not only how the food appears but also how appetizing it looks to us. Foods with high contrast, for example a grilled steak with asparagus, sweet potato puree, and béarnaise sauce on a white plate, usually appears more appetizing than those with low contrast, for example pasta with a white sauce on a white plate. Foods served on white plates tend to enhance sweet flavors in food, while black plates bring out more savory flavors, and serving food on a red plate has shown to reduce the amount diners eat. Service ware should be chosen to match the food, it’s shapes, and colors. There are a broad variety of tools that are used for plate presentations including squeeze bottles, spoons, thin-offset spatulas, and brushes for applying sauces on the plate. Tweezers and chop sticks assist in placement of components and delicate garnishes. Slotted, flexible fish spatulas work well for delicate fish and similar items. Stacking rings and geometric molds help to keep the food contained and add height to the layout. Although tongs are useful for sturdy items like steaks and chops, small serving spoons should be used when plating delicate foods including vegetables. Before beginning the plating process determine the focal point by visualizing how it will appear or draw out a plate diagram. The focal point should be the highlight of the plate and where the eye is drawn to first. Bright or contrasting colors, elevation, and food placement helps to highlight items. Usually our eyes scan a food plate much like a picture, from the lower left to the upper right. 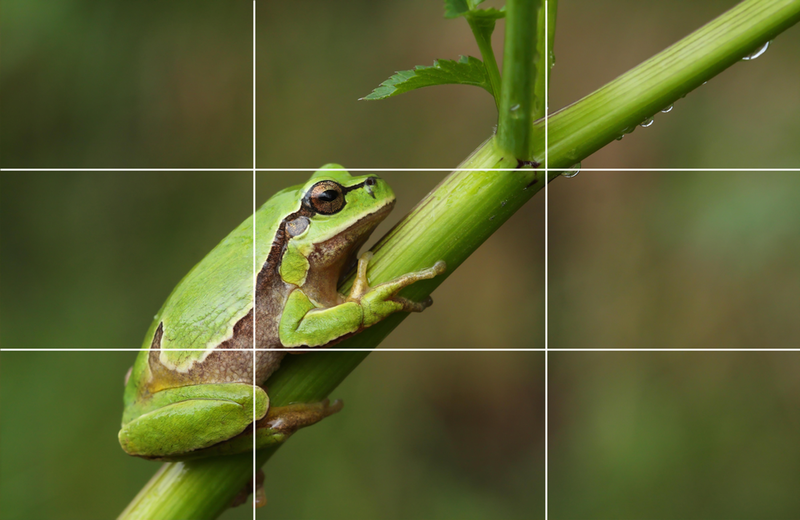 Photographer’s use this idea setting up a photo, called the rule-of-thirds, that divides a picture into thirds both horizontally and vertically and uses the intersecting lines as focal points. 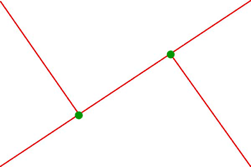 The alignment of the subject should be somewhere at one of these focal points and usually off-center. This template can also be used when apportioning the quantity of food on the plate, which as a general rule means no more than 2/3 of the plate should be filled with food, while the other 1/3 of the plate is negative or empty space. Avoid the rim while creating a buffer zone of ½ inch/13 mm of space from the rim to the flat of the plate. Play with symmetry, geometry, and sequencing of the foods. Use color contrasts to add visual impact and interest to the plate. Odd numbers are more pleasing to the eye than even numbers, so 3 asparagus spears versus four is better. Remember to keep the components of the plate in proportion to each other to balance the presentation. Determine the focal points, lines, and flow, as you apportion space to each element. Don’t crowd the plate; empty space will reinforce the focal point. Plate the foods simply without too much fuss or busyness. Food plating starts with the basics of functionality and practicality. Remember that the dish must be easily assembled on a busy night. The vision of a plate presentation is only possible to the extent of the quality of the food and the expertise of the kitchen. The food must be prepared and seasoned properly with a fresh, appetizing appearance. Vegetable cuts should be clean and uniform and retain their bright colors, sauces must have a proper consistency, and proteins must be browned and cooked to the correct degree of doneness. Fundamentals for plating start with serving foods on plates that are the correct temperature; hot food on pre-heated plates, and cold food on chilled plates. Establish a focal point, and compose the plate based on a central component. Create variety in shapes, textures, colors, and flavors. Use molded forms when appropriate, but avoid too many geometric and precise shapes that can make the plate look like it was stamped with a cookie cutter. Odd numbers bring unity and harmony to the plate and pull in the surrounding elements. Height creates drama so, much like a sculpture, design the plate with a 3-D approach. Simple techniques like fluffing salad greens, or overlapping slices of meat are simple ways to create height. Use sauces to add color accents to the dish. Garnishes should be relevant to the plate so avoid the use of whole sprigs of rosemary. Spices and herbs on the edge of the plate should be avoided, however the discreet use of chopped herbs that are relevant to the dish are fine for adding color to the composition. Before the plate is presented to the guest, it must be examined and cleaned as needed of excess food and smudges. Use mildly acidulated water with lemon or vinegar and a clean, lint-free cloth to wipe the plate. The kitchen’s responsibility includes how the plate is presented to the guest. In kitchen language this is referred to as the 6 o’clock plate position or the edge of the plate placed closest to the guest. Traditional plating presents the food simply by using a clock face as a guide. The entrée or main focal point is served between 4 and 8 o’clock. The starch is plated between 9 and 10 o’clock and the vegetables are plated between 2 and 3 o’clock. The sauce is served either under or over the main item. This simple presentation can be effective as long as the elements are balanced. Use the rule-of-thirds concept, overlapping the components, and the plate as a backdrop to frame it. Gain height by leaning the protein on the starch. The sauce will also act as a tying element too. Strong, clean lines that are vertical, horizontal, or angled, provide neat and logical dimension to the plate. Lines can be created by the placement of proteins, vegetables, or sauces. 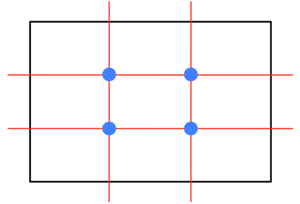 Patterns emerge by repeating these lines, and variety is introduced through intersecting or overlapping lines. The monotony of repetitive lines is interrupted by the addition of other food shapes and carefully placed garnishes. Arcs, swooshes, and swirls soften hard angular lines of the plate giving them fluidity and movement in appearance. Sauces and purees are commonly used to create curves. They may be juxtaposed with other plating designs including straight lines, or they may be layered to add height and dimension to the plate. Some styles of arcs use an off-centered approach that creates tension and drawing the diner’s attention to them. Another example of an arc is the golden ratio, a spiral pattern that is found in nature, including snail shells and sunflowers, and used in art and architecture. Stacked plating brings height and drama to the presentation by layering the components in a vertical style. Items can be layered either free-form or with a mold, but to avoid the cookie cutter effect, vary the ingredients to create different shapes and colors. The focal point of the stack should be off-center, usually to the left, with added garnishes and sauces to create variety and strength in the presentation. Crisp textures can be added at the base, in the form of pastry or vegetables, or as a garnish, in the form of vegetable chips or crisps. Soft textures, purees of root vegetables, provide a base, and double as an anchor to support the main item. Break up round or square geometric shapes with vegetables, pasta, grains or other items. Sauces provide accent and help to pull the dish together. Avoid the bull’s-eye effect when stacking by adding garnished elements cut into various shapes or use a saucing technique that breaks the round shape. Popular for small plates and samplers, trios are another approach to plating that uses odd numbers and negative space. A plate of trios may include a seasonal item prepared three different ways. It may incorporate hot and cold temperatures. It also is an opportunity for a chef to display multiple creative pairings and preparations. Trio plating can be done in a linear fashion, a triangular pattern, or even free form style. The concept of deconstruction re-imagines the elements of a dish in a new light. When presenting a deconstructed dish, it should hold the flavors and textures of the original inspiration (often a classic preparation), while creating a connection to the modern interpretation. Deconstruction is not merely serving separate elements of a dish on a single plate; rather a unified concept is woven throughout the plate. Desserts are good candidates for the deconstructed approach; for example, a strawberry shortcake can be broken down and recreated as a strawberry sorbet, dehydrated shortcake crumbles, crème fraiche sauce, and fresh strawberries. Kaiseki, a formal dining tradition that dates back 400 years to Buddhist monk traditions, balances the tastes, textures, appearance, and colors of the food. Seasonality is important in the cooking as well as in the type of dishes, which are selected to enhance the seasonal nature of the dish using a variety of different shapes, colors, textures, sizes. Each meal is represented by five colors, red, white, green, black, and yellow which contributes to the eye appeal as well as ensuring the nutritional healthiness of the food. Each menu also includes items prepared raw, simmered, fried, steamed, and roasted or grilled. Foods are precisely cut into bite-sized slices or pieces to be easily eaten with chopsticks, and served in small, individual portions in separate dishes. Plate presentations emphasize a slightly askew approach and use height to add for dramatic affect. Negative space is emphasized in the plating philosophy. Kaiseki has influenced western plating styles from Europe to North and South America. Tasting menus available in fine dining restaurants around the world draw inspiration from the Japanese concept of small multi-course plates that showcase a chef’s repertoire emphasizing seasonal and local foods.